Indoor Archery - Fun or Flop? I like indoor archery. OK, so it's rather disappointing having to wait until the Friday evening or the designated Sunday afternoon - and I do suffer from withdrawal symptoms not doing much shooting throughout January - but I do enjoy it when I do. Indoors we don't have to worry about the wind factor, or rain. No mud or flooded fields either. Just you and your bow, arrows and a target face. So shooting indoors you have a real chance to perfect your technique. 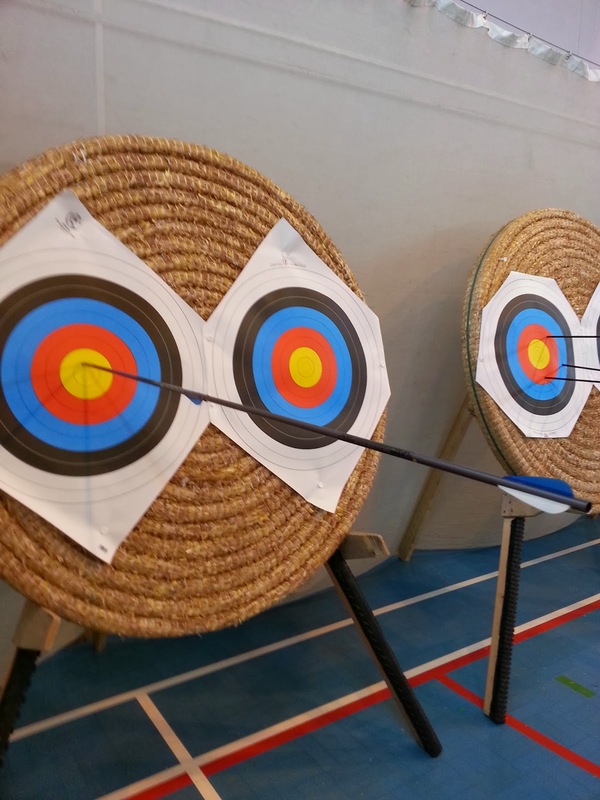 My Newhaven Archery club shoots in a school hall from October through to the end of March. Twenty yards is the maximum distance which means we usually do a Portsmouth round. We can do Brays and Worcesters too, and the odd FITA 18 or a Vegas. Any bowstyle - no different from outdoors. Most sessions are for practice and every month we do a postal round in competition with other clubs. We also have our winter championships and a club Vegas competition. Just before Christmas we have a Fun Shoot. And it really is fun. Funny target faces, bingo - all sorts of very small spots to try and hit. And we have little prizes too. The fun is in taking part and, let's be honest, no-one goes away empty handed. I think most of our newer members are a bit nervous about shooting indoors, and there will also be some who prefer to have a break during the winter months. OK, so it's a bit cramped setting up in the corridor and then shooting in the hall when there are a lot of us, so we often have to run two details on the line. But if the first round of the evening goes smoothly, a few of us will stay on to shoot a second (double Portsmouth is a recognised shoot). Not many people do this, but the one time I was able to I managed to beat the 8 year old county club record by all of one point! We do have trouble encouraging people to come along though. Is it perhaps because they get home from work and don't feel like going out again? 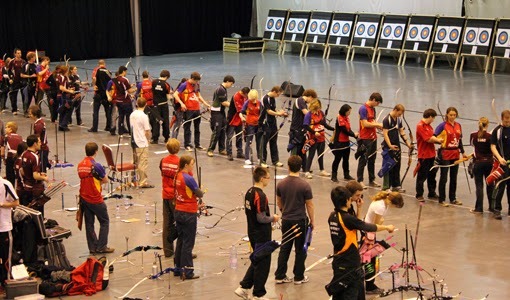 Or perhaps folk feel nervous shooting at such close proximity to one another - but that is extremely good practice in what may be considered a more 'formal' setting - good preparation for the discipline of outdoor competitions which can be quite crowded. If I have one main criticism of how we run the evening, it's because it's very, almost too, quiet. The only real banter is when we go to collect our arrows, with the usual quiet whispering while we are waiting. I think there's a lot to be said for having the fun we saw at the 2012 Olympics archery - lots of loud stuff! Sometimes it can be too quiet. The other thing which may make people reluctant to come along is perhaps the feeling that everyone is watching them. Well, to some extent we do, but not in any way to criticise and it is only going to be the people closest to you - and we do that at the field anyway. Every one of us is genuinely interested in how people are getting on, yet while we know we must not offer to help and advise unless asked to by the archer, we are all ready to help. I'd love for our club to have a more permanent location during the winter. I find the enforced break during January to be very frustrating. I do wonder if we can find a warehouse to rent for those five months, or perhaps a well-appointed barn somewhere, but I know it may be expensive (but hiring the school hall is expensive too). So, what can we as a club do to encourage you to come along? We are the same people and we all enjoy our archery to the bones. Come on - be brave and join us more often. We miss you! Any questions? Use the contact form top right to email me.